Senate Bill 7 (Block Grant Funding) was passed by the Kansas House of Representatives on 3/13/15. The document shown below shows the impact to Andover USD 385. The PowerPoint shown below shows the impact of Senate Bill #7 (Block Grant Funding) for USD #259. "We Have Everything to Lose", as recently posted on EudoraRocks.org, a blog by Superintendent of Schools Steve Splichal. "There are few times worse than when you learn that the district you lead — the one you care most about — may likely lose the funding it needs to provide a great education to the students you serve. That time is now." "Area districts worry about state funding", as posted on The Marysville Advocate website on 2/18/15. Valley Heights Superintendent, John Bergkamp, explains impact to that district. Flores is deeply concerned about a pending bill, Senate Bill 71, in the Legislature that will force more funding cuts in the district if it passes this spring. “If they do that it’ll be another $47,000 cut immediately,” he said. USD 113 Prairie Hills Superintendent Todd Evans, explains "Once the district’s five years “lock-down” budget ends this school year, the district will face $580,000 less in state aid." "'Something to Think About' from Brent Windsor, Emporia Board of Education", as posted on the Emporia Public Schools website on 2/18/15. "These decisions will hit Emporia in many ways. Our school district will certainly lose $269,000 and if future payment delays are implemented, as projected, those losses will easily rise to $517,000 or more. ESU will see cuts of $632,000, our civic infrastructure will begin to degrade and Emporians depending on social assistance will find it harder to meet their needs." "Open letter: Superintendent Eric Reid USD #327", as posted on Facebook on 2/16/15. "This impacts USD #327 with a mid-year cut of $41,199 from our general fund budget. Mid-year cuts are difficult for schools with most money already committed to contracts and utilities, and it can be challenging to find areas to save money." "Valley Center, Lawrence superintendents take to social media to express budget concerns", as posted on Wichita Business Journal website on 2/11/15. Immediately, Doll said, the Lawrence district will lose $600,000 from its current-year budget, and he says he doubts that money will be restored in the future. "Making mid-year cuts is extremely difficult because our budget has already been established and contract and program costs are ongoing," he said. "We must make cuts as we make plans to manage what we're going to do next year." "Superintendent gives math lesson on financial outlook for Kansas schools", as posted on Osage County News website on 2/11/15. "For many, if not most, school districts, last year’s Kansas Supreme Court ruling, as well as the resulting new law, did not increase their revenue; rather, it only reduced their local property taxes." "Therefore, USD 336’s budget will be reduced by approximately $70,000.00 on March 7, 2015. This will be done through allotments as ordered by the Governor." "GUEST COMMENTARY: The Bonner Springs-Edwardsville School District's response to the school budget situation", as posted on The Kansas City Kansan website on 2/11/15, by Dan Brungardt, Superintendent of the Bonner Springs-Edwardsville School District. The automatic cuts do not require legislative approval and are scheduled to go into effect on March 7th. By instituting this reduction measure, this partially helps to plug a hole in the state's looming budget deficit. Specifically, it will save the State of Kansas $44.5 million in the current fiscal year. The cuts were announced after the state missed its January revenue expectations by $47 million. What does this reduction mean for USD 204? The actual budget reduction resulting from this cut in the Base State Aid per Pupil for our district will be $143,315 in the current school year. READ THE FULL ARTICLE AT THIS LINK"
"Less is still less" as posted on USD 373 Business Buzz blog on 2/10/15. "So, what does this mean for Newton? As mentioned previously, should SB71 be signed into law, USD 373 will receive $191,451 less in LOB equalization aid. The governor's allotments, set to take effect March 7, will reduce our district's general fund by $188,045. The governor has indicated that, should the legislature rewrite the current equalization formula that impacts LOB and Capital Outlay state aid, they could possibly negate the need for the allotment. However, it is also possible - and we feel highly likely - that both reductions will occur during our current fiscal year." 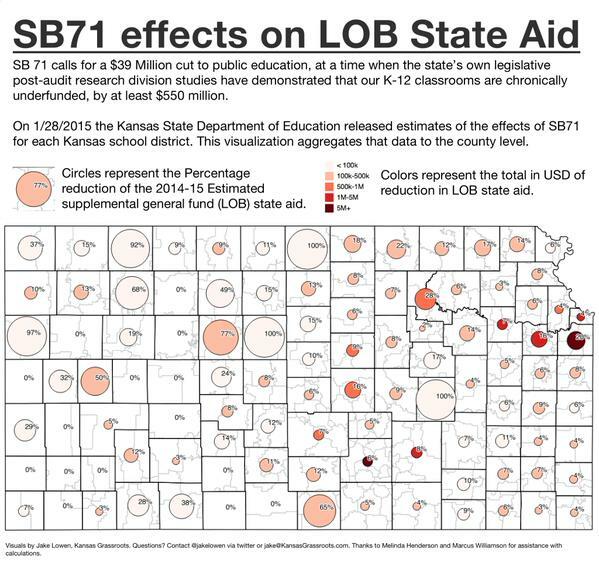 "SB 71 effects on Local Option Budget State Aid", as shared on Twitter by Jake Lowen on 2/9/15. USD 470 addresses financial impact, Ballard sounds budget alarm at Monday night’s meeting, as posted on arkcity.net on 2/10/15. The newest cuts have left USD 470 approximately $174,000 shy of its previous budget numbers for the 2014-15 school year, school board members learned at their regular meeting. While the school district has $180,000 in contingency funds, district Superintendent Ron Ballard said he is hesitant to use those funds because the district might need that money well into the next school year. If it is passed, an additional bill, SB 71, could cost USD 470 yet another $126,000 in funding, Ballard indicated. 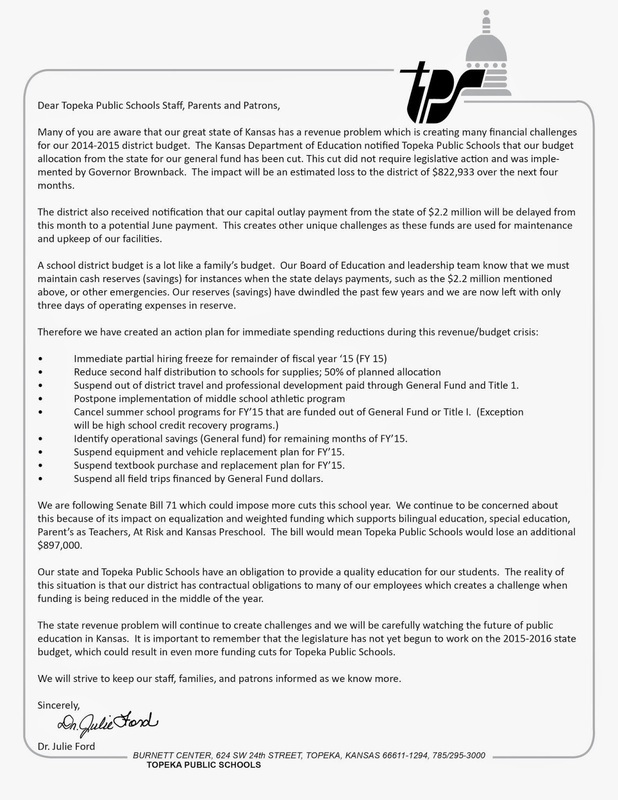 Message from Doniphan West USD 111 School Board, as posted on The Doniphan West USD 111 website on 2/10/15. As you have probably already heard, Governor Brownback recently released his proposed budget for K-12 Education and to Higher Education. Part of that budget that directly affects our district includes a 1.5% cut from the K-12 Base State Aid per Pupil. This change will most likely continue into next year’s budget and will negatively impact the amount of dollars we have to spend on education. "Superintendent’s Blog: The Sunshine Has Officially Left The District! ", as posted on USD #372 Superintendent Blog on 2/9/15. "Unfortunately,	the	state	hasn’t	fully	funded	the	formula	since	2008	and	has	instead	reduced	funding. Our	opera8ng	funds	are	determined	by	Base	State	Aid	Per	Pupil	(BSAPP)	which	was	set	at	$3,600	when	the	formula	was	wri_en	in	1992. BSAPP	was	supposed	to	be	at	$4492	several	years	ago,	a	figure	inflated	by	$244	with	money	from	a	weigh8ngs	reduc8on	in	2005. If	you	calculate	the	Governor’s	latest	cut	to	educa8on	in,	BSAPP	actually	stands	at	$3,566. That	is	not	a	misprint,	we	are	now	funding	our	opera8onal	budgets	well	below	where	we	began	twenty-three	years	ago!" USD 489 chief reacts to school funding cuts: ‘Here we go again’ , as posted on the Hays Post website on 2/9/15. Gov. Sam Brownback announced the proposed 1.5 percent cut to K-12 funding on Thursday, along with a 2 percent cut to higher education, just as the House and the Senate forwarded a budget balancing bill to the governor. Brownback’s self-described tax “experiment” has led to a projected $344 million deficit by June 30. Brownback’s latest proposed cut reduces the base state aid per pupil from $3,852 to $3,810.25 meaning a loss of more than $155,000 for USD 489. "Kansas school funding formula yields oddity: Some wealthy districts get extra state aid", as posted on The Kansas City Star website on 2/6/15. He said it’s unfair portraying the district as receiving money it shouldn’t because of its income wealth. Blue Valley may have the highest average household income of any district in the state, but Trigg points out that it still ranks 62nd out of 286 school districts in the amount of taxable property per student. "USD #400 Budget Discussion", as posted on Smoky Valley Public School's website on 2/5/15. "As you may have heard, this afternoon Governor Sam Brownback announced 1.5% cuts to K-12 public schools. The Governor exercised “executive authority”, which means it does not require legislative approval. In the Smoky Valley, this translates to $59,356 cut to our current budget. This is not good news." "You also need to be aware that the legislature is currently working two bills. Senate Bill 71 would cut $95,340 also from the current fiscal year, from our local option budget. Senate Bill 4 would delay a portion of capital outlay payments from this current budget year until June." "Message from the Superintendent", as posted on Eudora Schools USD 491 website on 2/5/15. "I must also note that the legislature is currently working two bills. Senate Bill 71 would cut approximately $75,000 from the current fiscal year from our local option budget. Senate Bill 4 would delay a portion of capital outlay payments from this current budget year until June. Please understand, the measures being discussed in Topeka are only temporary fixes to the current budget year. Given revenue forecasts, there is every reason to expect the pain of cuts to schools will continue for some time."